Ravens’ Roost is Anchorage’s first and only Cohousing neighborhood. It has a total of 35 homes and our last 2 are ready for purchase. Ravens’ Roost is set on 6 acres of land with large sections of native birch and spruce. 1. A large common house with kitchen, dining room, library, kids playroom, laundry room and 2 guest rooms. 2. A large workshop equipped with multiple building and wood-working tools, ski and bicycle maintenance areas, sewing/craft area, and exercise equipment. 3. Outside of the Common House are raised garden beds for personal use and community dinners. There is space allotted for our planned orchard and lots of space for kids to run around and play. We also have a resident beekeeper. 4. 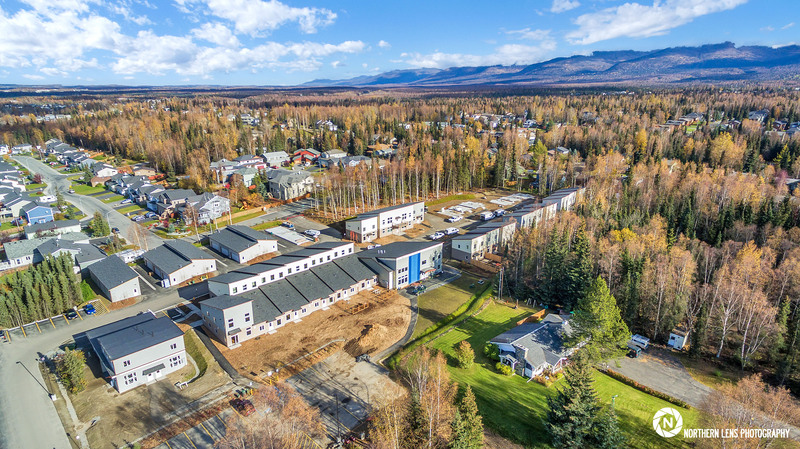 The site is conveniently located in southeast Anchorage with easy access to arterial roads, yet still nestled in the quiet foothills of the Chugach Mountain Range. We are close to shopping, restaurants, 2 Universities (UAA and APU), 3 hospitals, and lots of trails for mountain biking, hiking, walking, skiing (cross country and downhill) and snow boarding. A paved bike path connects to many other paved bike paths, making making Ravens’Roost bike friendly and accessible to many parts of Anchorage by bike. 5. Ravens’ Roost is located within a two mile radius of a High School, three elementary schools and a Jr. High School. We have private and charter schools near by as well. 6. If you like craft beer we have 4 craft breweries within 3 miles of here and you can bike to each of them. We currently have 32 households, many from Anchorage but others from Fairbanks, AK, the east coast and the Southwest. We are a multigenerational community from infants to seniors with diverse backgrounds. Detailed bios are available on our website. We are actively seeking new neighbors to join our community and we welcome inquires at: ravensroostcoho.org. 2 brand-new townhouse-style units are available for sale and immediate occupancy, plus one additional unit available for re-sale. Check out our website at: ravensroostcoho.org.